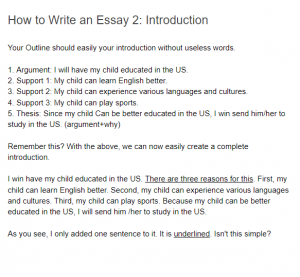 Your Outline should easily your introduction without useless words. Argument: I will have my child educated in the US. Support 1: My child can learn English better. Support 3: My child can play sports. Remember this? With the above, we can now easily create a complete introduction. I win have my child educated in the US. There are three reasons for this. First, my child can learn English better. Second, my child can experience various languages and cultures. Third, my child can play sports. Because my child can be better educated in the US, I will send him /her to study in the US. As you see, I only added one sentence to it. It is underlined. Isn’t this simple?